Mercedes-Benz has updated its successful V-Class van line for 2019, bringing the five-year-old passenger van up to speed with more safety tech and a new diesel-powered variant. Competing with the likes of the Volkswagen Transporter and Hyundai iMax, the rear-wheel-drive V-Class currently consists of two variants; the V220d at $76,300 and the V250d at $88,880. The range is set to expand with the addition of a V300d variant that’s powered by Mercedes’ new 2.0-litre four-cylinder turbocharged diesel engine, and teamed with a segment-first nine-speed automatic transmission. The V300 will make a class-leading 176kW and 500Nm, with a claimed combined fuel economy figure of 6.3 litres per 100km. Mercedes-Benz says there’s an extra 30Nm of torque available in the V300’s acceleration phase, as well. The V-Class vans score a redesigned front bumper with the option of a trendier AMG Line version, along with new alloys and the choice of four new paint colours. The interior has been lightly done over as well, with Mercedes-Benz adding fully reclinable leather seats as an option. Mercedes-Benz has also added AEB to the V-Class, along with automatic high-beam dipping. 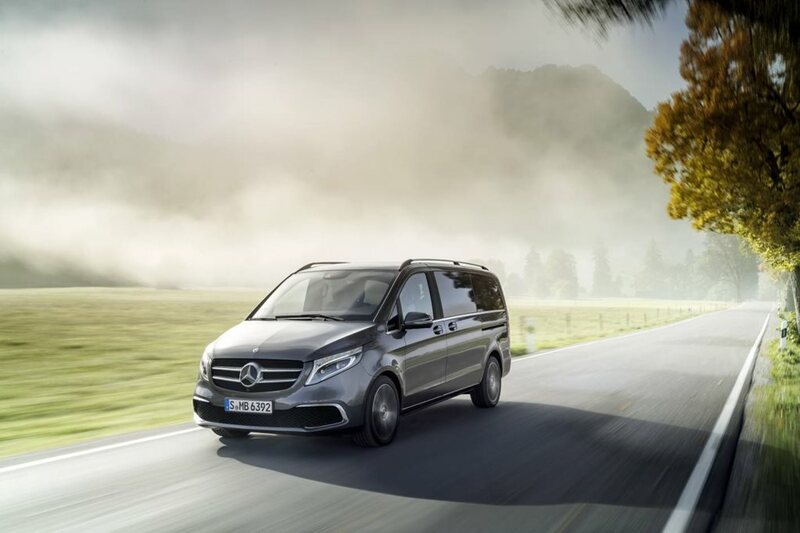 “The V-Class is for families with an active lifestyle who need space and comfort, but don’t want to forgo luxury and safety,” says the managing director of Mercedes-Benz Vans Australia, Diane Tarr. Meanwhile, Mercedes-Benz says it will soon offer fully electric van for what it terms as private use. It already offers an electric version of the smaller Vito van, while the eSprinter is set to launch in the second half of 2019. We’ll get a first look at what Mercedes-Benz is offering in the electric passenger van space next month at the Geneva motor show, along with the next stage of its GLC-based EQC electric SUV (below).